When I first started sewing, I thought all quilts were assembled one square at a time: tiny snippets of fabric pressed, sewn and pressed again into more elaborate patterns. I’ve since learned that quilts are assembled in a variety of ways — sometimes taking strips sold in roundels called “jelly rolls” which can then be cbxvvvvgut down into blocks and then squares. Which is what I’ve done here. It’s a bit of the old alchemical solve et coagula. Except that here it’s coagula et solve. The strips are assembled into larger panels first and then the large panels — 6 6/8″ by 43″ are cut down into 6 1/2″ blocks or squares that fit together into quilts. And then there’s another coagula step — building quilts out of the squares. Math teachers may object to the 6 6/8″ fraction. Clearly they’ve never made a quilt. Have you ever tried to measure 2/3″ on a ruler before? Sometimes, teachers need to remind themselves that the actual measured experience on the roller, is more important than the abstraction of the reduced fraction. Sometimes it really is 6/8, because that will become two 3/8″ measurements under the sewing machine needle. We have to be careful about letting our formalized abstractions get in the way of the lived experience of the artisan. 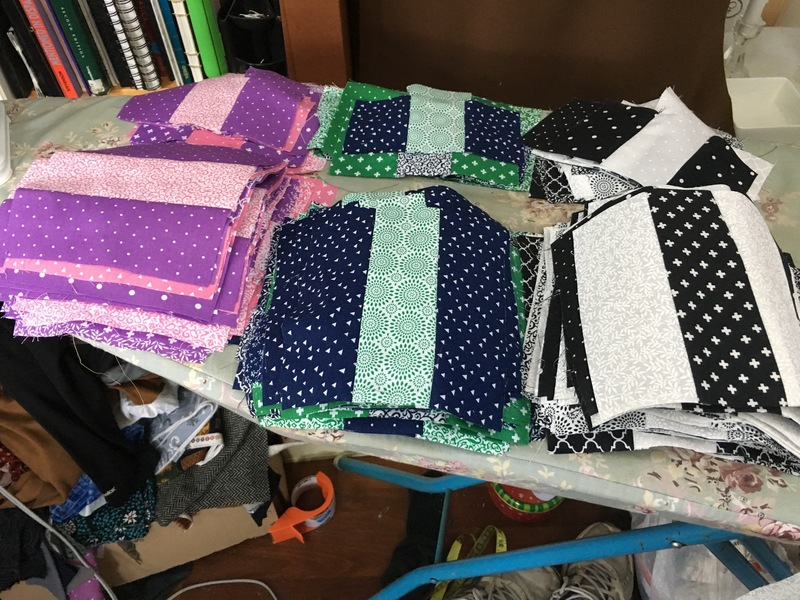 There are enough cut squares in the front three piles of the second photograph for one queen sized quilt, one twin sized quilt, for crib quilts or throws, or eight infant quotes. I have some decisions to make.